In addition to the statutory Early Years’ Regulations, there are two other national frameworks that guide the work of Early Childhood Education and Care (ECEC) services, including childminders. Aistear, the early years' curriculum framework, provides ECEC services with a guide for helping young children learn. 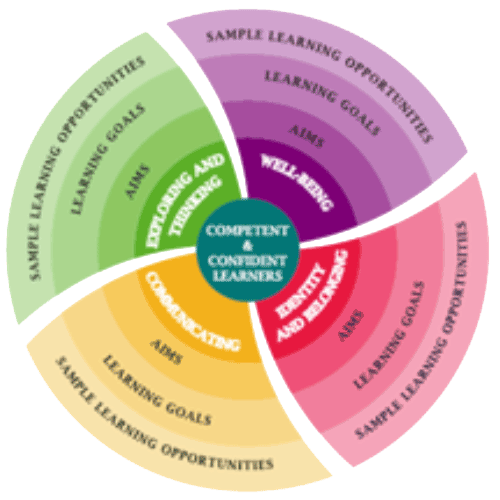 Its four themes – Well-Being, Identity & Belonging, Communicating and Exploring &Thinking – help you organise your approach to facilitating children’s learning. There are great examples of good practice for childminders in their learning experiences. 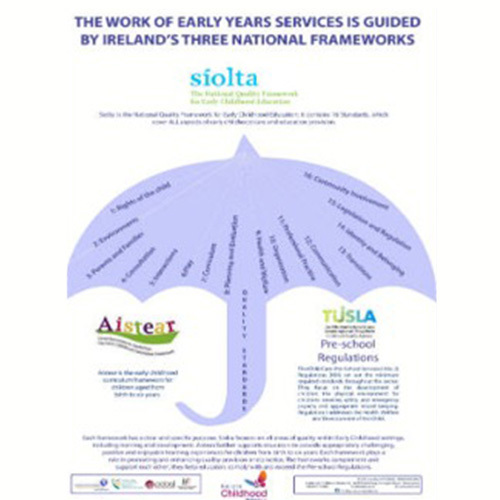 Síolta lays out QUALITY standards for ECEC services - 16 standards seen here between the spokes of the umbrella. The Síolta guide for childminders helps you reflect on how you can apply each standard to improve the quality of your service. And we also have the Aistear Síolta Guide – making the links for childminders available to download. The free Pre-School scheme offers appropriate educational activities to young children aged 3-5 during the two years before they start primary school. For many children, it’s their first formal experience of early learning, the starting-point of their educational and social development outside the home. The preschool provider is paid a capitation rate per child. The current capitation rate of €64.50 per week per child where the pre-school leader is qualified to at least a major Level 6 NFQ (or equivalent). The higher capitation rate of €75 per week per child is paid where the pre-school leader is qualified to at least a Level 7 NFQ. Usually, this scheme requires at least a minimum of eight children in a service before the service can join the programme. However, a childminder who holds the relevant qualifications may apply to join the scheme if there are five children in the service and the need for the provision in the area can be demonstrated.